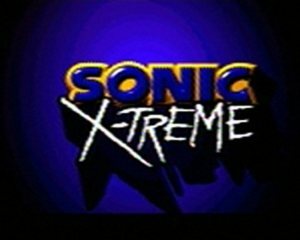 The tech demo has been found in a dusty box in some guys garage as of September 10th, 2005. So what IS it exactly? 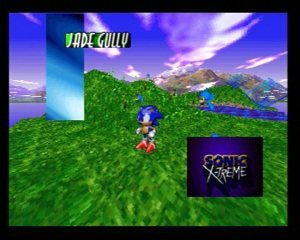 Thanks to TheRedEye, we have captures of the demo in action. 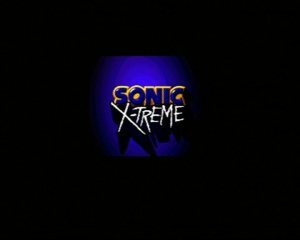 When the demo is booted up, this Sonic X-Treme logo appears. Nothing special, but does the job for this little tech demo. 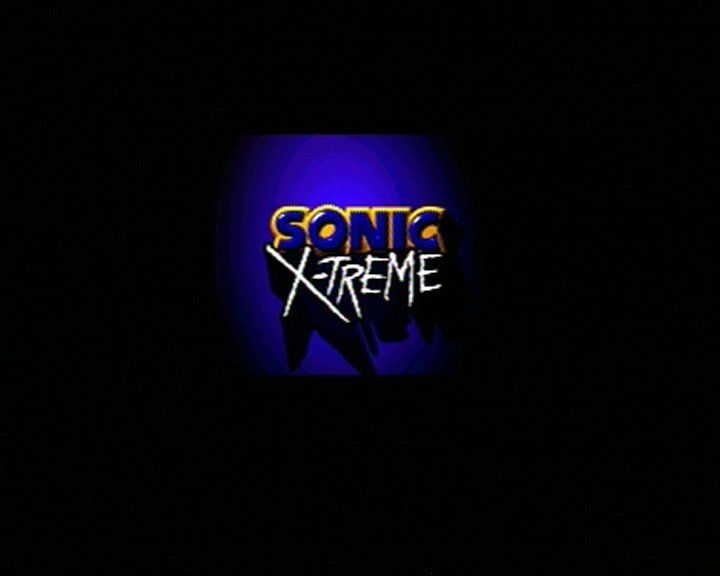 The Sonic X-Treme tech demo is just that. 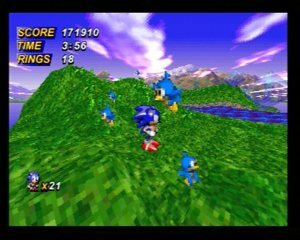 It's absolutely nothing like what the "closer to being finished" version is, it's merely a very early piece that shows just how Sonic might appear to look like in the third dimension. At the beginning of the level, entitled "Jade Gully", which is a name used for a later revision's level, the name and Sonic X-Treme logo float onto the screen for a few seconds, much like the Megadrive games. 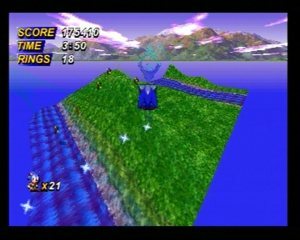 It will then dissapear, and control will be given to the player. This image was actually taken from a Saturn Emulator, so the screen is much sharper. 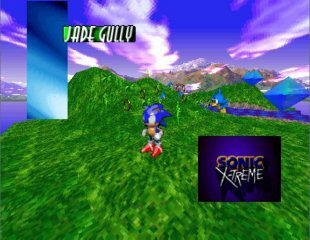 The level itself is very very bare. 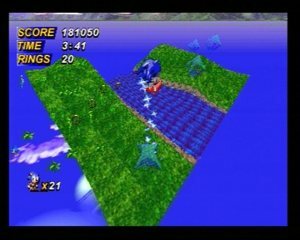 You've got your green hills, your lake, and that's about it. Flicky sprites are stuck in the air for a little scenery. As mentioned, there are little lakes spotted around the area. They do nothing other than run an animation. Sonic will also get some water splashes following his footsteps. 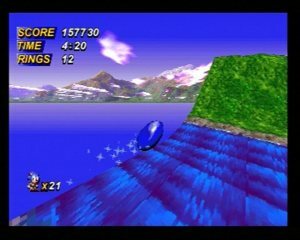 Throughout the level are little transparent diamonds, seen later on during the boss levels in a later version. 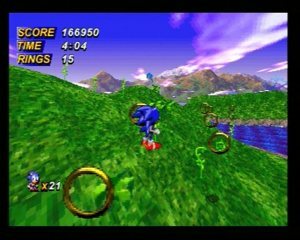 They do nothing, but probably are there to show the transparency effect they were able to create, something which is very rarely seen on the Saturn. 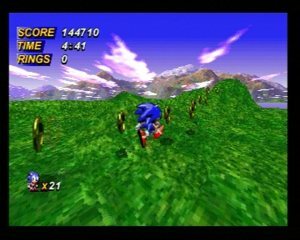 Interesting note: Sonic R is one of the VERY few Saturn games with "Fade-in", props to Traveller's Tales. 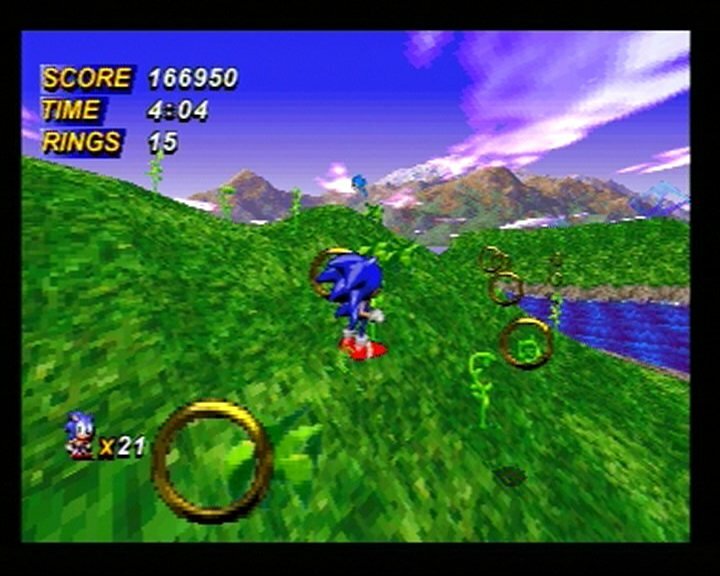 Rings were added around the land scape, and are collectable. The Heads-Up Display for the tech demo has a time limit on it. The timer begins at 5:00 minutes, and counts down. Once the counter reaches zero, it will end the demo. The score will constantly get bigger by the second, merely there to show it works. 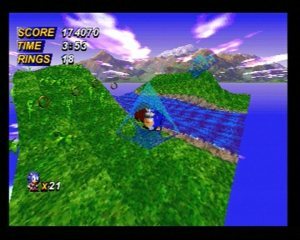 The demo starts with 21 lives. No particular reason is given for it. The level is very linear, there are no large areas, it's merely a straight path from A to B, possibly repeating itself over and over. 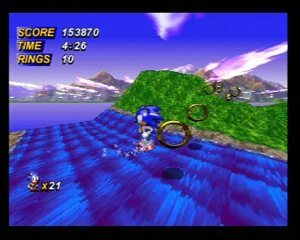 The spin dash is also implemented somewhat. The animation appears, and sparks will appear behind Sonic. Sonic will then blast away in a roll at top speed. 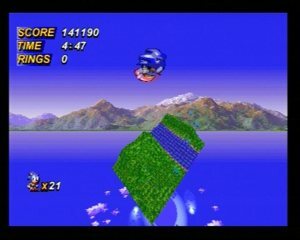 The player was able to get VERY high above the level! 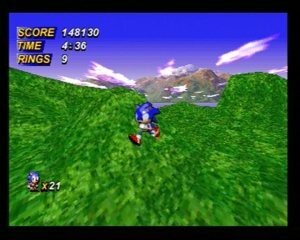 It may look small in area size, but that'd due to the severe pop-up the demo has, where new pieces of land will pop up the closer you are to it, to keep slowdown as low as possible. Closer to the ground, more of the level pops up. Another image, showing a star trail that would follow Sonic around when he moves. 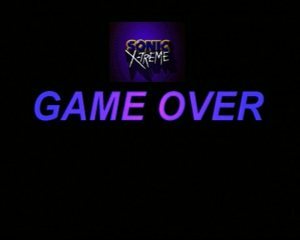 It then flys backwards, and the words "GAME OVER" appear.